Have you ever watched those old movies set in the Amazonian jungle, featuring the likes of Victor Mature or Charlton Heston hacking their way through dense undergrowth, and thought 'that looks like fun'? Well Barranisky is the hill for you. I was determined to take the easiest route to the summit, so I followed Simon3's route as far as the old ruin at T25533 79336 B. However, there was another green road off to the right before the one mentioned, and so ensued 30 minutes of crawling on hands and knees through dense forestry. I eventually emerged, scratched and bedraggled onto the correct green road, and then spent another twenty minutes battering my way through 7ft high gorse to the summit. 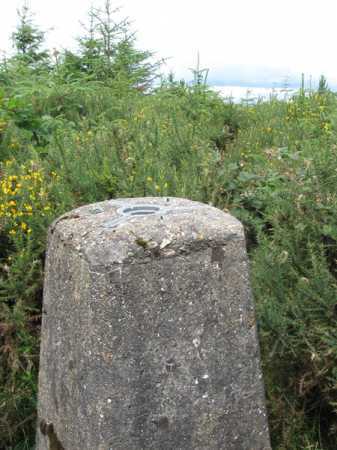 The trig pillar, when it suddenly hoves into view, has something of the Raiders of the Lost Ark feel.. I would have been only mildly surprised to see a crystal skull set atop it.